Not long ago I was in a breakfast discussion with a health care sales professional who was contemplating a significant job change. We were discussing some of the nuances of his current assignment – and the frustrations. The comment reminded me of a comment a friend and colleague offered at a sales meeting I attended some time back as he reflected on a latest organizational initiative. It’s a legitimate question for every company – and every industry – especially now. 90% of the world’s data has been created in the last few years – with close to 4 billion humans a part of the Internet population. The U.S. generates some 2.657 million gigabytes of data of data PER MINUTE. Globally, the output of data – 2.5 quintillion bytes per day. Meanwhile Internet based platforms are expanding exponentially – led by Amazon, YouTube, Netflix, and friends. 15 plus million text messages per minute, 450,000 tweets, and well over 100 million spam emails per minute …. Now, here’s the stunning part – the facts above are 9 months old – and each of the figures cited are far too low. The reality is the numbers are increasing so dramatically that it is impossible to say with any accuracy just how much information is out there…other than to declare it’s a lot. So, this is a good thing – right? Not necessarily – in fact the deluge of information that courses through our lives – and through most companies – can sometimes have the opposite effect. Namely – data overload, indecision, frustration, and stress. My coffee companion isn’t an outlier – not by a long shot. Ron Friedman’s recent article in Psychology Today says it best – too much of a good thing isn’t a good thing at all – and can actually impair quality decision-making – a premise that is supported by experts like Bob Nease, former Chief Scientist for Express Scripts. Data – in and of itself – has a capped value. Channeling or harnessing technology – streamlining its application is mission critical. Many employees are struggling – and require help in making sense of what is and is not relevant. The “toss as much against the wall as possible and hope employees figure it out” mentality crushes organizational effectiveness. Data may be the building block – but ONLY if it leads to quality information that transfers into insights that offer competitive value at the employee level. The real power in organizational knowledge comes only when it becomes systemic – and technology can either facilitate that path or encumber it. There are isolated centers of excellence in every company – and they often remain just that – isolated. Organizational learning is spasmodic – and few companies are fully leveraging the potential of The Digital Age – nor recognizing the scope of the resource that courses either through their company or around it. And so those same companies repeat past errors – while visionary firms make data driven After Action Reviews a part of how they conduct business – constantly adjusting and improving based on the wealth of intelligence that is there for the taking. But change is coming – if for no other reason than it must. Progressive companies that recognize that the gift of technology can be blessing or curse are moving swiftly to harness the gales. Greek mathematician and philosopher Archimedes’ timeless quote of a few thousand years ago is perhaps more relevant today than ever before. It’s a vivid metaphor for what can be as regards data and technology – but leveraging the inherent strengths will require more than hope. In Archimedes’ simple machine, the fulcrum became the pivot point – the critical component. 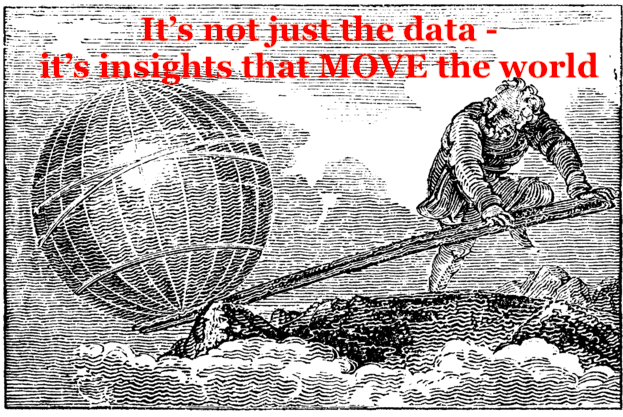 If data is the lever in today’s world then insight may very well be that fulcrum. Synergies there may create lift that is truly staggering. Rich Horwath’s description of business strategy in his book Deep Dive has never been more relevant. The intelligent allocation of limited resources through a unique set of activities to outperform the competition in serving customers. No resource offers as much unbridled potential as technology optimized – harnessing the power of Artificial Intelligence in ways that transfers the digital hurricane into meaningful action – and frustrated employees into empowered agents of change. For astute companies that can see that point on the horizon an amazing era is about to unfold. The author wishes to thank the various sources cited above – Psychology Today, IFL Science, Fast Company, and Rich Horwath for his landmark book on business strategy. The quotes attributed to Archimedes and Deming may or may not be apocryphal – but the essence of their message is indisputable in The Information Age.